Over the last few months, I have researched many books and maps and created a series of maps that attempt to illustrate the history of Toronto’s street railways, from 1861 to the present. Toronto is one of only a few cities in North America to continually operate a street railway network (others include Boston, Philadelphia, San Francisco, and New Orleans), which remains one of the busiest and most expansive tram systems in the world. Before the Toronto Transportation Commission was created in 1921, Toronto was served by several private streetcar firms. The Toronto Street Railway, which began operations in 1861, built Canada’s first streetcar system; two routes were opened that year, with small railcars pulled by horses. The TSR’s successor, the Toronto Railway Company, electrified the network, but with few exceptions, refused to expand it beyond Toronto’s 1891 borders. Only with the creation of the publicly owned TTC was Toronto’s streetcar system unified and modernized to be the envy of cities across the continent. Creating these 38 maps was a challenge, because published materials covering the pre-TTC era (before 1921) are sparse. William Hood’s Street Railways : Toronto: 1861 to 1930 provides some history of Toronto’s earliest transit services, but with only some details. I also consulted Transit Toronto’s route histories and other books such as Robert M. Stamp’s Riding the Radials and John F. Bromley’s Fifty Years of Progressive Transit which covers the years from 1921 to 1971. This post, the first of three, will cover the years from 1861 to 1891, the era of the Toronto Street Railway (TSR), when horse power ruled the streets. I do not cover every year, and I omit some minor service and route changes. But this, I hope, accurately illustrates the rise, fall, and renaissance of Toronto’s streetcar system. The TSR begins operations on September 10, 1861, serving a small provincial city of less than 50,000 people. The first route, Yonge, operates from Yorkville Town Hall, just north of the city limits, to St. Lawrence Market at King and Jarvis. A second route, Queen, was established in December of 1861, running between the market and the Ontario Hospital at the corner of Dundas Street, now Ossington Avenue. The TSR expands for the first time, with new routes on King Street between Bathurst and the Don River, and on Sherbourne, Carlton and Parliament Streets to Cabbagetown. The Yonge line is extended south to Union Station at Front and Simcoe Streets. Toronto’s fifth streetcar route, Spadina, opens, from King to College. The King Car is extended to Strachan Avenue in the west, and a new branch of the Sherbourne Car extends north to Bloor Street. Two more routes, Church and Brockton (Dundas Street to Dufferin) begin operating; the Sherbourne streetcar to Cabbagetown is extended east on Winchester Avenue to Riverdale Park. 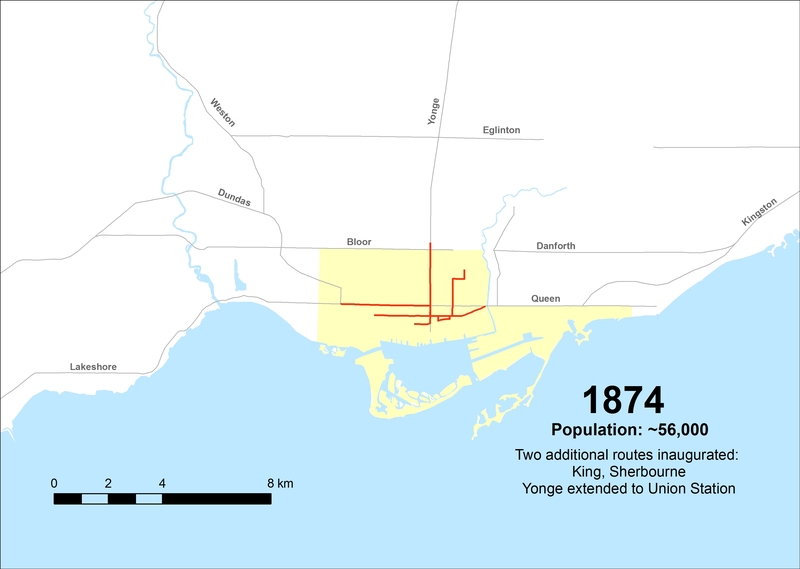 The City of Toronto annexes the Villages of Yorkville and Brockton and parts of York Township to the north and west of the city limits. Streetcar service follows as the Yonge Line is extended to the Canadian Pacific tracks near Summerhill Avenue, a new streetcar route runs on College and Bathurst Streets towards Seaton Village, and the Brockton and King Cars are extended west. The first radial railway opens when the Metropolitan Railway begins operations between Montgomery Avenue and the Canadian Pacific Railway on Yonge Street to the north of the city. 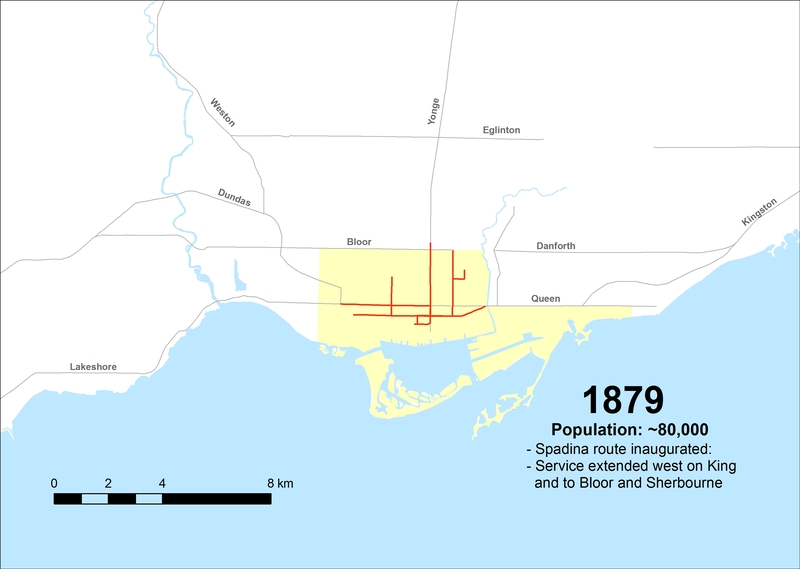 What we now know as the Annex is annexed in 1887, along with Seaton Village. A new Carlton crosstown streetcar service begins, from Dovercourt and Bloor Streets to Gerrard and Sumach Streets. The King Car is extended to the Beach, which becomes a popular summer resort. In May 1891, the Toronto Street Railway’s franchise came to an end. But it didn’t stop it from extending the streetcar system in its last few year. Parkdale is annexed and the Queen Car is extended to Roncesvalles Avenue, the Bathurst Car is extended to Dupont Avenue, and new carlines are established on Broadview Avenue and Bloor Street, among other service improvements. A total of 14 routes span the city. 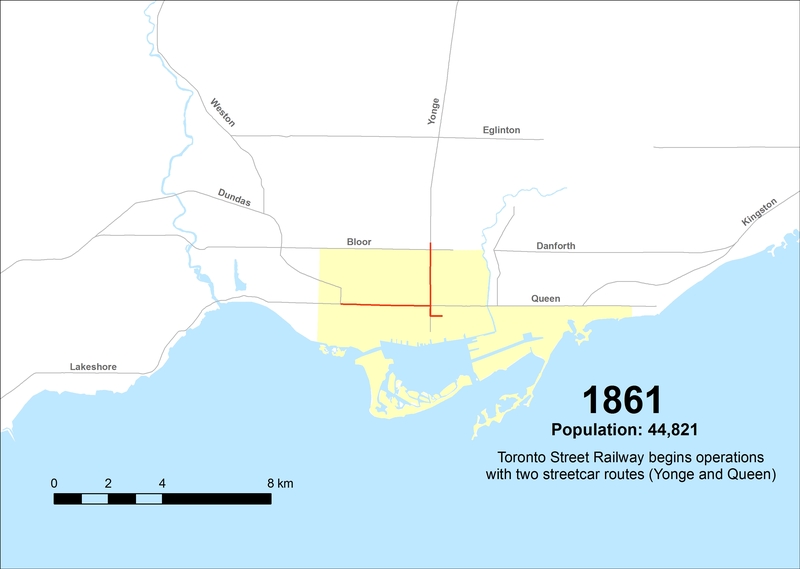 The city, now with a population of 181,220, grants a new streetcar franchise to the Toronto Railway Company, which promises to electrify the entire network by September 1894. However, the franchise only calls for servicing the current city boundaries, which will prove to be a problem in later years. This entry was posted in History, Maps, Toronto, Transit and tagged Maps, Streetcars, Toronto Street Railway, TSR, TTC. Bookmark the permalink. This looks really amazing Sean, what a great effort. Just a note to say caption on first photo should be Fonds not Fords. Which considering Toronto history is way more complicated! Lol.